Before we get to Achievements, I want to give a quick update on Steam. The Steam version of Prismata is actually coming together surprisingly quickly. In the last couple of weeks, our dev team has managed to incorporate the Steam installer/updater, Steam login, Steam friends, the Steam Wallet, and yes, the much-requested Steam Achievements. We still have lots of QA work remaining, but everything seems to work so far! We’ll be initiating some more expansive closed testing soon. 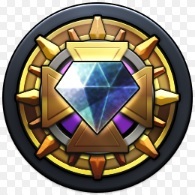 Achievements will also be available to players outside Steam, and each achievement will unlock an equippable badge for players both inside and outside of Steam. The Badge Menu will be receiving a cosmetic overhaul as well. Achievements are great for Prismata, especially on Steam, because they generate popups on the Steam social network that help advertise Prismata by celebrating player accomplishments in the game. For this reason, it’s great to have plenty of achievements, especially those that will occur randomly in the normal course of play. Got any cool ideas for an achievement that you’d like to see in Prismata? Let us know!